Coconut Oil is derived from one of the most sacred fruits of the Pacific. The oil is derived by shredding coconut and then cooking the oil out of the kernel. and allowed to mature for a minimum of three weeks before shipping. some of that special Cook Islands South Pacific style and elegance. 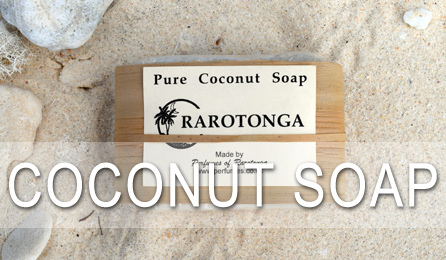 Perfumes of Rarotonga bring you the very best in hand made perfumes, natural coconut oils and coconut oil soaps. 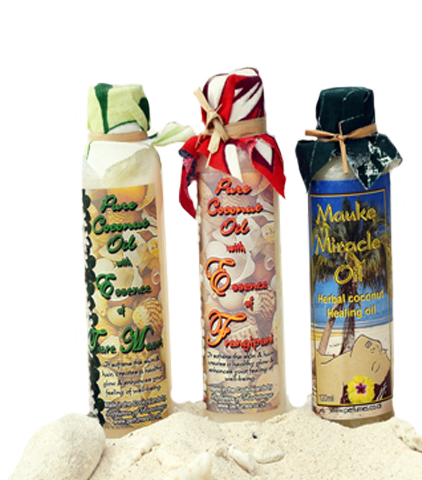 All our products are made in Rarotonga and capture the very essence of the Cook Islands in floral perfumes and the premium scents. Our Frangipani, Gardenia and Jasmine have a simple freshness associated with the early morning sun rise. Later in the day the essences of Pearl of Paradise and Queen of the Night have a more complex and exotic scent that stimulates the imagination. Coconut is the tree of life in this region and has been revered throughout history. It is part of the culture in so many ways. Our coconut oil soap is hand made with 100% coconut oil which means it is rich in natural glycerine and so very good for the skin. All testing is done on ourselves - hence we are clean and sweet smelling people! You can combine our natural soap with many of perfumes. 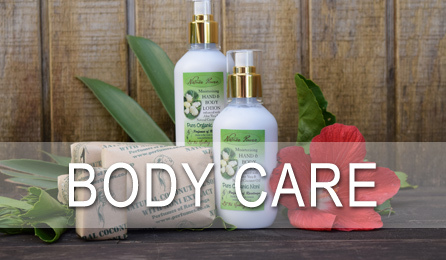 We developed a range of body care products like the hand and body lotion, shower gel, shampoo and conditioner which are also combined with a selection of our perfumes and now you have the ability to immerse yourselves in Rarotonga emotions. If you've been to the Cook Islands - then relive your visit. 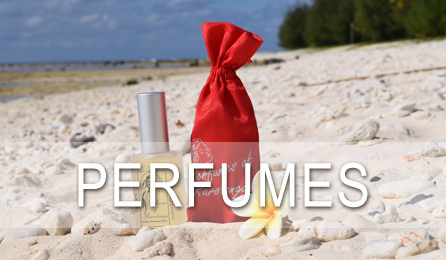 If you haven't - then you can just imagine and be drawn by the perfume that is Rarotonga. SORRY DUE TO POSTAL RESTRICTIONS we can no longer post our perfumes. We can ship all our oils, perfume oils, toiletries but sorry - no perfumes. If you are interested in a bulk shipment we can certainly enquire for you. Products indicated with "Call for Prices" are those affected. I had problems with exzema on my feet, and my friend said try some of this Mauke Miracle Oil. The exzema has all but cleared up, but thought I would invest in 2 bottles of the oil. I can't believe the difference! I purchased the soap, Pearl of Paradise Perfume and Jasmine Perfume. I get so may compliments when I wear the Jasmine Perfume. Thank you for capturing the memory of your beautiful Island in a bottle. I had the pleasure of buying some of your "Frangipani" perfume while in the Cook's last year. I must tell you that it is the most wonderful perfume I have ever used. Thank you. Your soap left my skin feeling soft & luxuriant. Loved the lemon scent. After using it I had to go to the shop to take some home with me. It is the best soap I have ever used. Your soap lathers well, perfume suitable for male and female....very creamy and soft. Totally blown away by the 'Pearl of Paradise' perfume you have recently made. It is absolutely beautiful and un-like any perfume I have ever smelt. Kia Orana! This is a greeting you can hear everywhere in Rarotonga. Translated from Cook Islands Maori it means “May you live long!” We are happy to share our Paradise with you. We're not a big company - or a mass producer - but one who cares about the products we sell. Our staff make everything by hand in Rarotonga - the closest we have to "machinery" is a 40 year old foot operated press for our soap moulds! 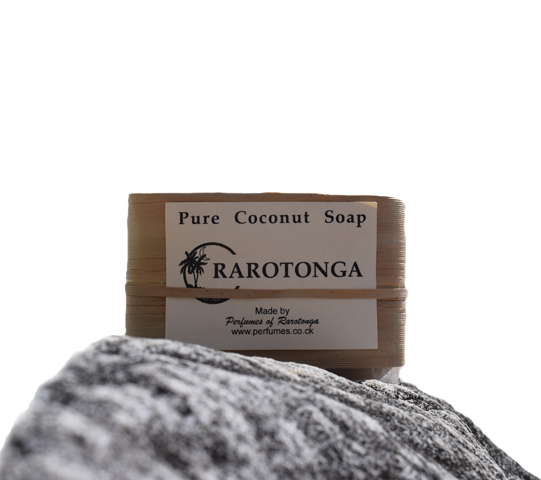 Whilst on the subject of soap we should mention that it is made with 100% coconut oil - absolutely wonderful for the skin. Thank you for your support..